If you're moving a short distance, often it's not necessary to pack lamp shades separately from their base. But if you're moving a long distance or storing your items in a storage facility for a while, then you should always pack lampshades properly so they won't get damaged. Shades are delicate and attract dirt and dust. Choose a moving box that's large enough to accommodate your lampshades—plus a little room for paper or other packing material. Securely seal the bottom of the box with packing tape. If the box is a lot bigger than the shade, make sure you line the bottom with packing paper or towels or other soft material to provide a cushion. If the shade fits into the box perfectly, there's probably no need to add cushioning. If you want to pack more than one shade in the box, start with the smallest shade. Hold the first shade by its wire rim and place it into the box, making sure it's centered. Cover the first shade with plain newsprint or brown packing paper, then slip the second shade on top of the first. Be sure to use plain paper, not a regular newspaper. Repeat the layering of your shades until all your shades are nested, ranging from the smallest to the largest. Make sure there is enough room to secure the box without pushing down on the nested shades. Do not pack any other items on top of the shades, not even soft items like linens. Shades are fragile and can easily be crushed. And almost any pressure on them can misshape the fabric or bend the wireframes. You can add packing paper on top of the shades if there's enough room in the box. If not, close the box and seal it with packing tape. Label the box as "fragile" and indicate which end is up. Also, note the contents and which room the movers should move it into. If you're moving on your own, load the shade box into the truck so that nothing else is stacked on top of it. Put the box in a secure location, such as in the leg space underneath a desk. Wash and dry your hands before packing lampshades. Shade fabric tends to be light-colored and stains very easily. It's also often delicate and difficult to clean. Always pick up the shade by the wire rim. Never squeeze the sides of the shade. Nest shades together whenever possible. This not only saves space, it also provides greater protection from damage. Always use plain paper for wrapping lampshades. Printed newsprint will leave ink and smudges on shade fabric, and ink will rub off on your fingers, making the problem worse. Plain newsprint is commonly sold at office supply stores in large, loose sheets, such as 24 x 24 inches or 20 x 30 inches. 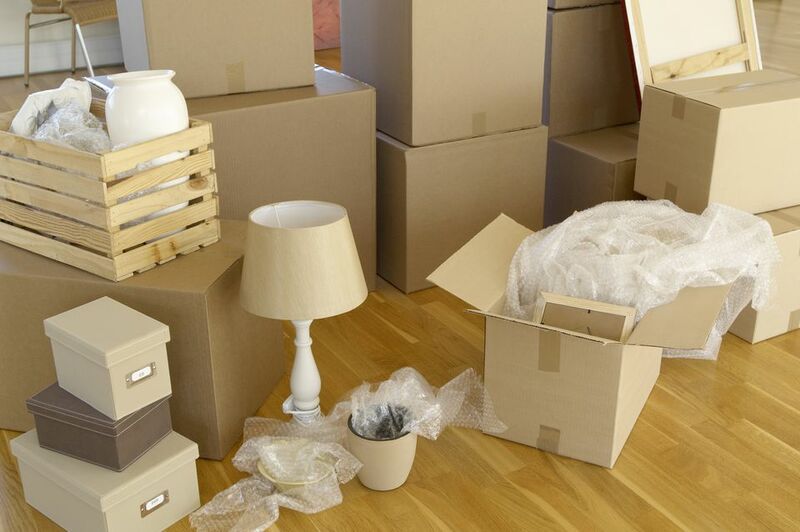 Are There Items You Cannot Pack When Moving a House?